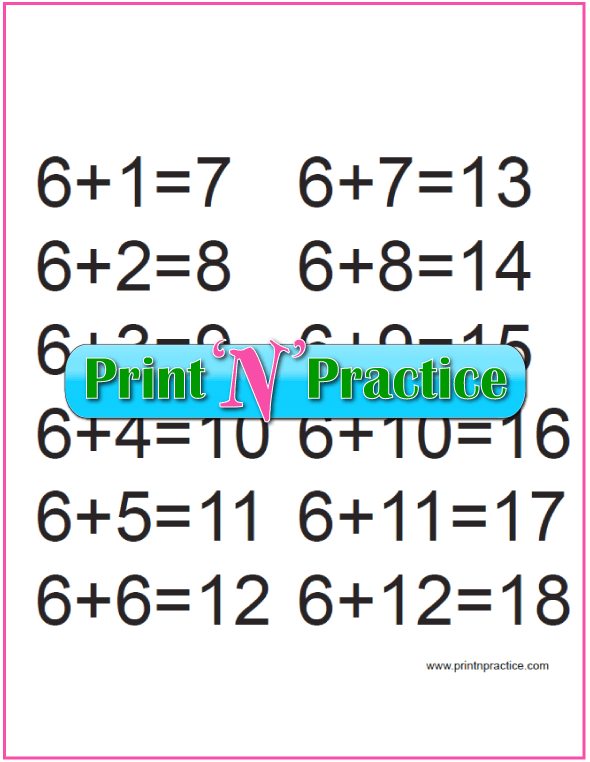 Addition Worksheets For Kindergarten. 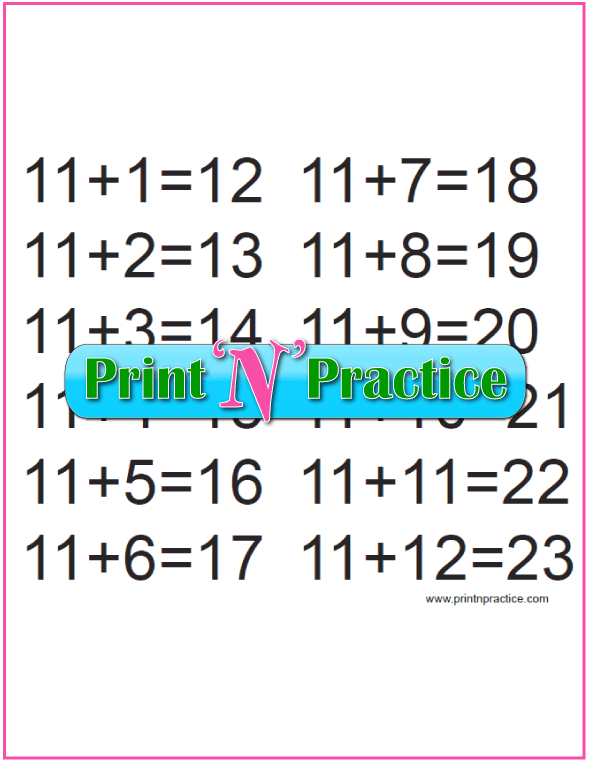 Practice equations three times each. You've hit the jack pot with these printable addition worksheets for kindergarten, first, and second grade. You'll find the links to our best printable addition worksheets and addition flash cards. They really teach adding. 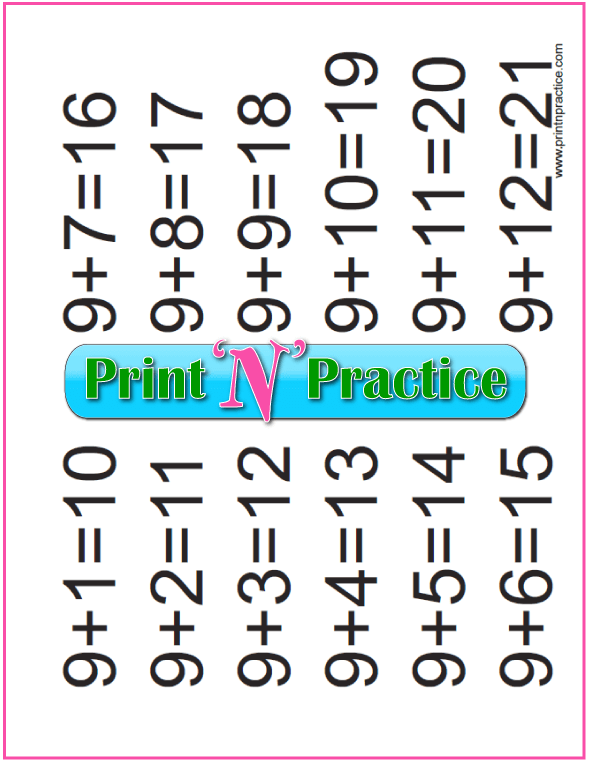 These printables cover the first twelve addition tables. Individual Worksheets For Addition Practice - First, practice the addition equations. Addition Flash Card Videos - Opens to new page of addition videos. 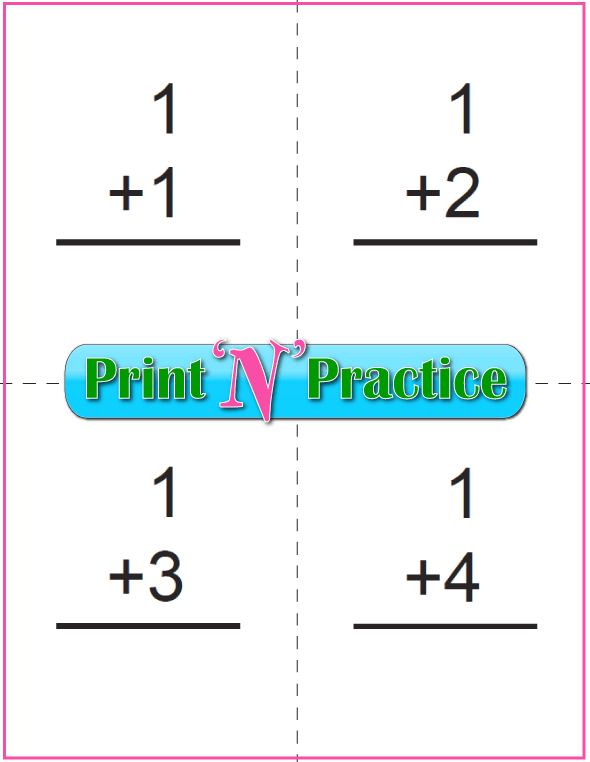 Printable Addition Flash Cards - Two Sides: Blank & Answer Sides. 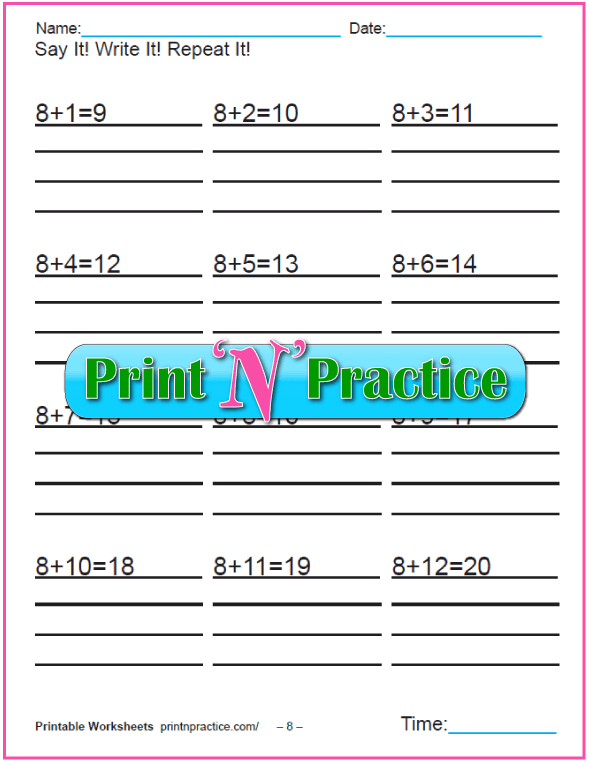 Addition and Subtraction Worksheets - 2 in 1. Addition Tables Fill in the Blank - Practice with answers at top. Landscape Addition Flip Charts or Posters - Large easy reference. Portrait Addition Flip Charts or Posters - Use clip board style. 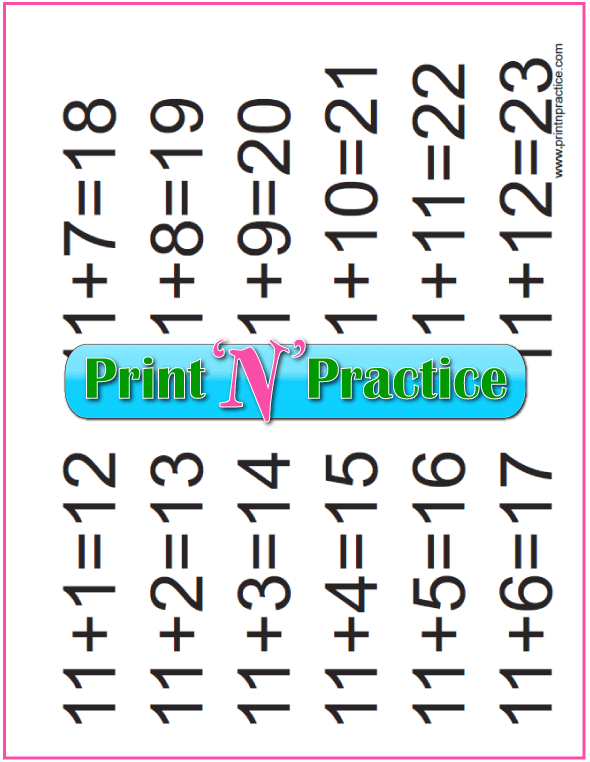 When your children already know how to count, these will be your favorite printable worksheets for helping them learn how to add. You'll also find addition videos that kids can watch on phones and tablets. Do be sure to laminate the printable addition flash cards if your printer uses water soluble ink like my Epson printer does. A sneeze or spill can blur the ink and if you laminate the cards you can use paper or thinner card stock. 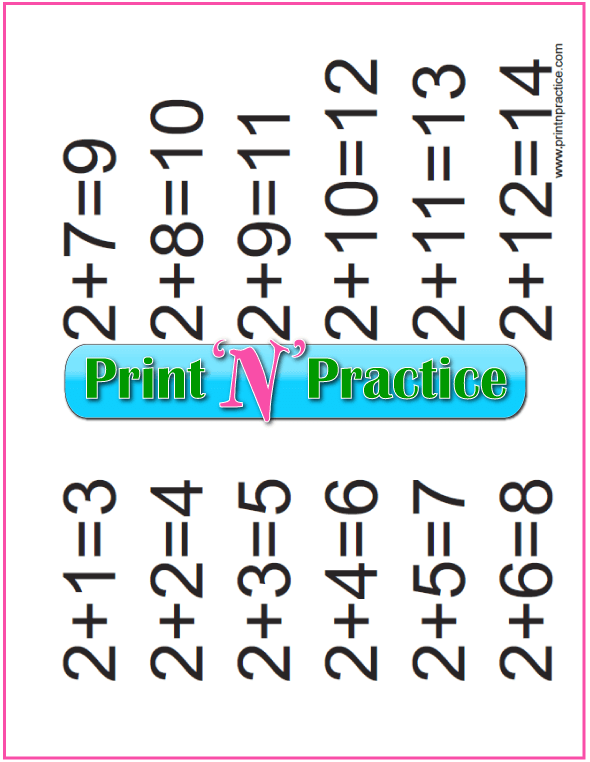 These sheets are for practice and you can use them with any school program or homeschool curriculum, especially where the program does not teach the facts in order, or include enough repetition. Your students can take the quiz later. 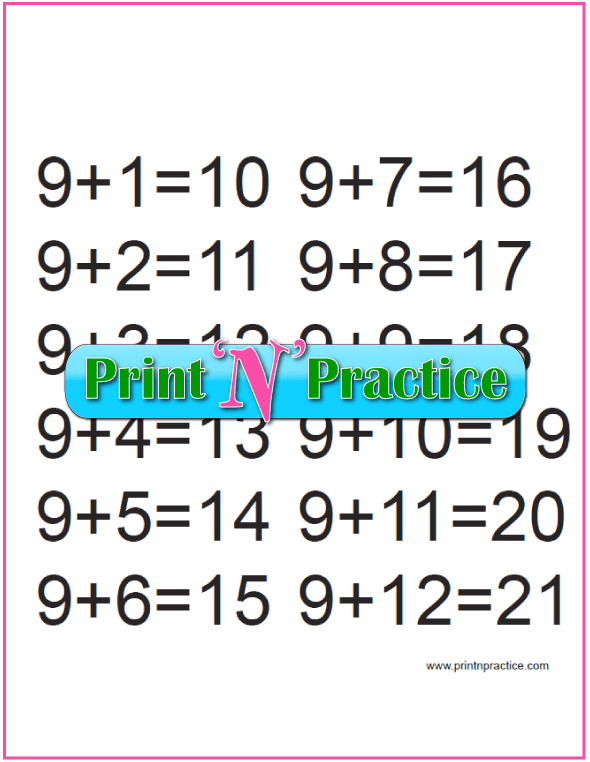 You'll find these worksheets in groups in order of how advanced a child would be. As you go down the page, you'll find worksheets that older children can use. Try using several different sheets together by putting several of each table together in a binder both for practice and later for review. When your child is working on the ones addition table, use the ones charts from sections #1 and #6 together. The same for the other tables. For older children's review I add in #5. 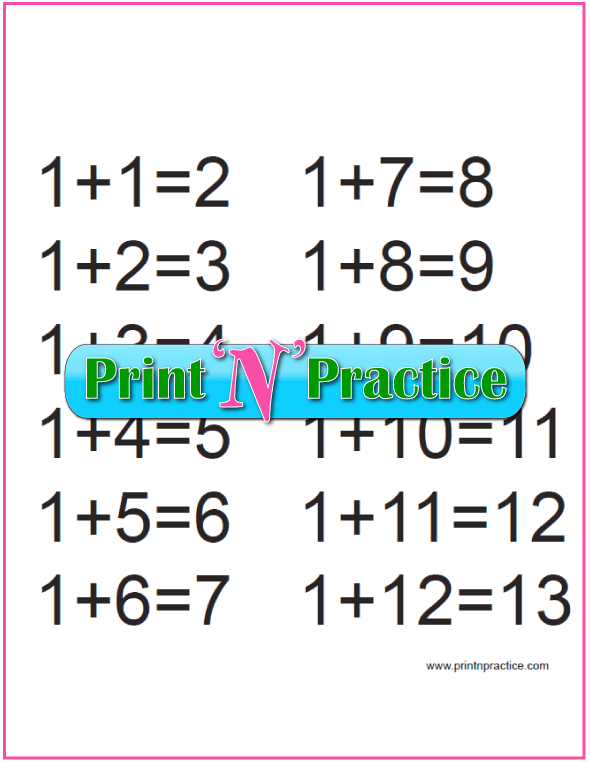 Use these Math addition worksheets for kindergarten and later years both when your students are beginning to practice learning the equations for the addition, facts and when they need a quick review. Review the words that are used in equations: plus, equal/s, addend, answer, equation. It's a whole new vocabulary different from counting. Have your kids copy each equation three times and say the words out loud. This is an excellent habit to start early. If they say it out loud while they write, they'll actually save time learning the addition tables. The next few tables after the ones table will be easier simply because the lingo will be easier and the children will recognize an equation better. 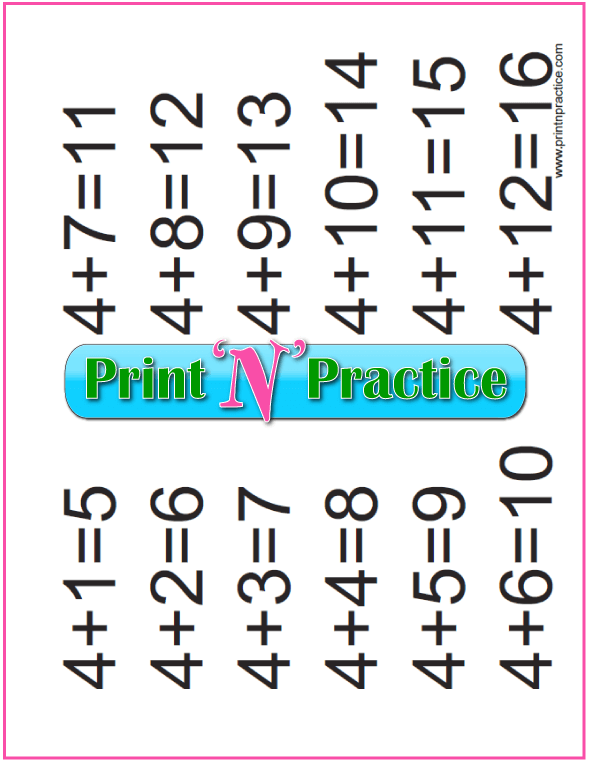 These are also excellent first grade addition worksheets. 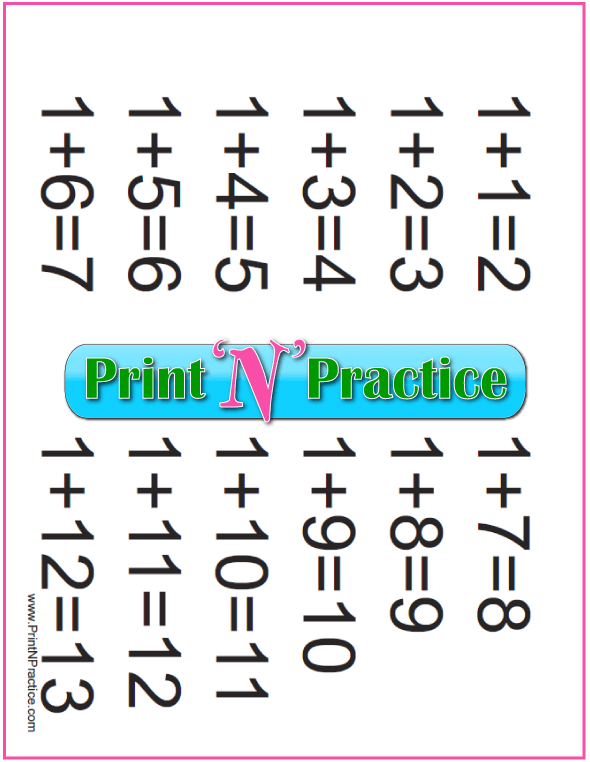 Teaching addition facts is easier once the kids know the vocabulary. Children learn the tables faster by saying the words as they write the Math symbols, too. I think that this is a step that some Math lessons miss. 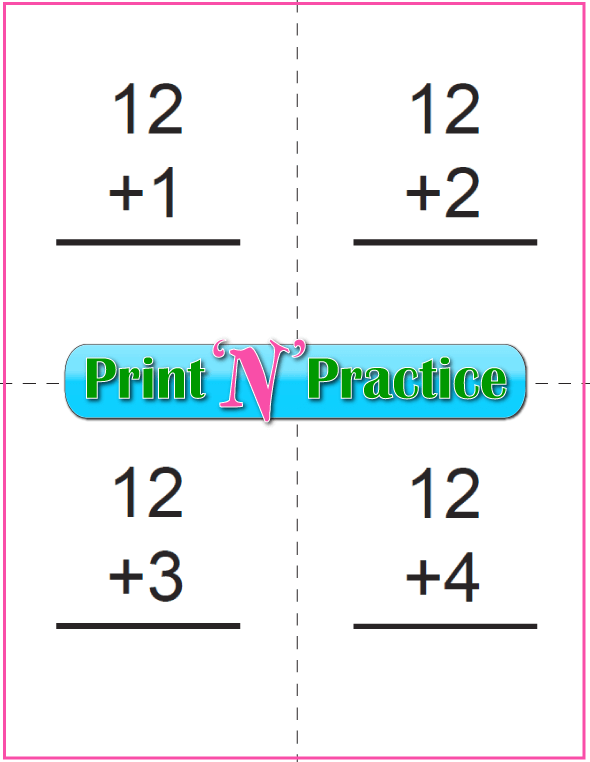 Assign only the table your students are practicing, as these printables cover one table each. This is my main addition page and includes links to the entire collection. 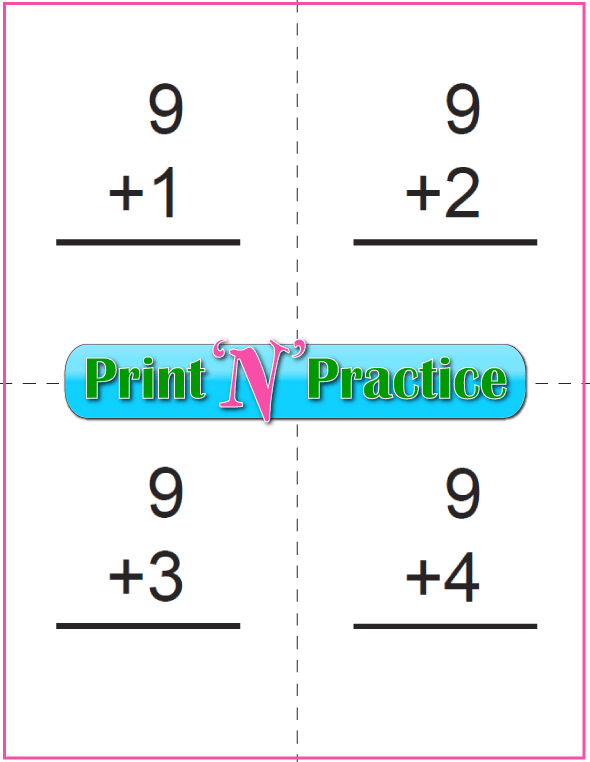 There are also printable charts that you can use for reviewing with our addition worksheets for kindergarten at the bottom of this page. After they review out loud with you, they'll finish their worksheets better. Remember to make sure that your students count fairly well and understand the terms in an equation before you begin. 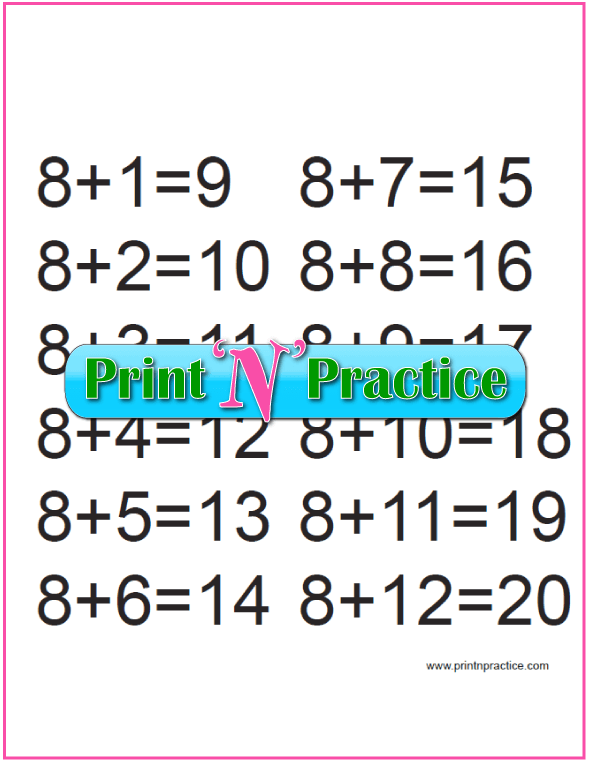 If your students do not know the names of the numbers or how to write them, go to our counting worksheets. If they do not understand the addition equation, take time to do addition orally so that they get used to the vocabulary. There are several ways to indicate the action of adding: plus, and, add, the sum of, more. Use your fingers and little toys that are big enough that they won't easily lose or swallow. An equality might be a new concept for most children in kindergarten. Simply use little sentences to show what adding is; what an equality is. You see, the term "is" indicates an equality itself. I remember finally realizing this in college! I could scan for is, are, was, etc., and find definitions. "This and this are two." is the same as saying "This and this equals two." The word equal is a verb in these places. I have more ideas for using Math practice worksheets on this page. 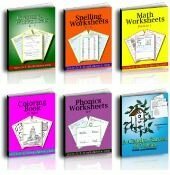 This is the whole set of the same addition worksheets for kindergarten from above with all twelve addition worksheets for kindergarten in one download. The downloadable addition chart on the left is handy to keep in a binder. 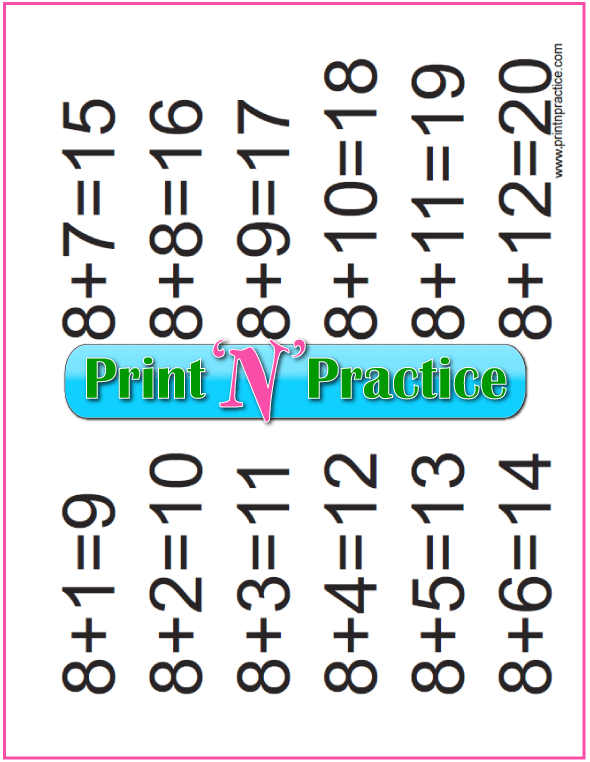 I keep our chart printed on card stock with the subtraction tables printed on the back side and it lasts for years. Super handy. Why addition videos? Well, easy repetition without needing a tutor. "Mom? What's five and four?" Answer: "Repeat after me quickly: Five and four are nine. Five and four are nine. Five and four are nine." That's it! Quick repetition is painless. Let our videos help your kids learn quickly and save you time. It's also called purposeful practice. A mistake? Practice it right three times quickly and "erase" the mistake in your memory or habit. Older children can simply repeat your first answer three times on their own. Show them that if they'll make a personal habit of purposeful practice they'll have an easy time learning new things for the rest of their lives. You can see all of our twelve ad-free addition videos on this page. 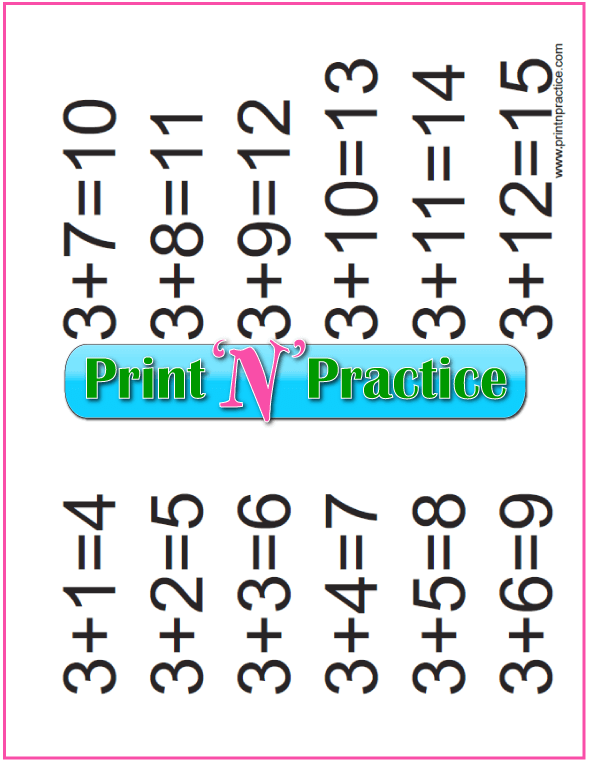 Bookmark for your kids to use with these addition worksheets for kindergarten. Accuracy is most of Math. Practice develops automaticity (what a word!). If your students practice, they'll know their facts automatically. If you have a student who hasn't absorbed the memory work, put the flash cards in order and encourage him with the ease of simply repeating the equations together with the answers. 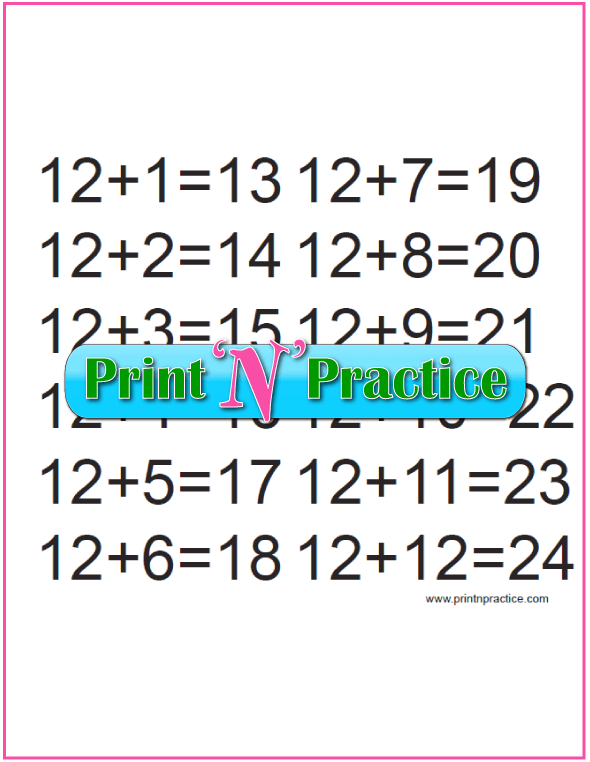 This is easy practice which is a short cut to memory work. If he has been bogged down working with a computer or copying the equations, the easy moments with the flash cards might be what it takes to make the addition facts "stick"! Remember that manipulatives can be very helpful, too. 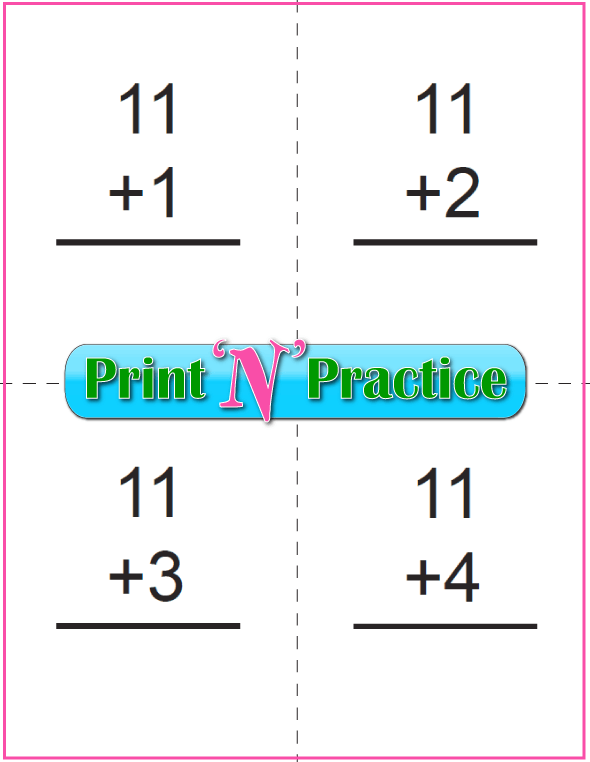 See our printable addition flash cards below. Each icon has six sheets; three with answers, three for the back without answers. This covers all twelve equations for each table. You can print them all to have each set on its own, or stop at the third page and manually replace the cards to print the back sides. Ink friendly. If you have the answers on the back side, you'll want to use card stock. Even then it can be easy for kids to peek to see the answer through the card stock if the sunshine is coming through a window behind you. 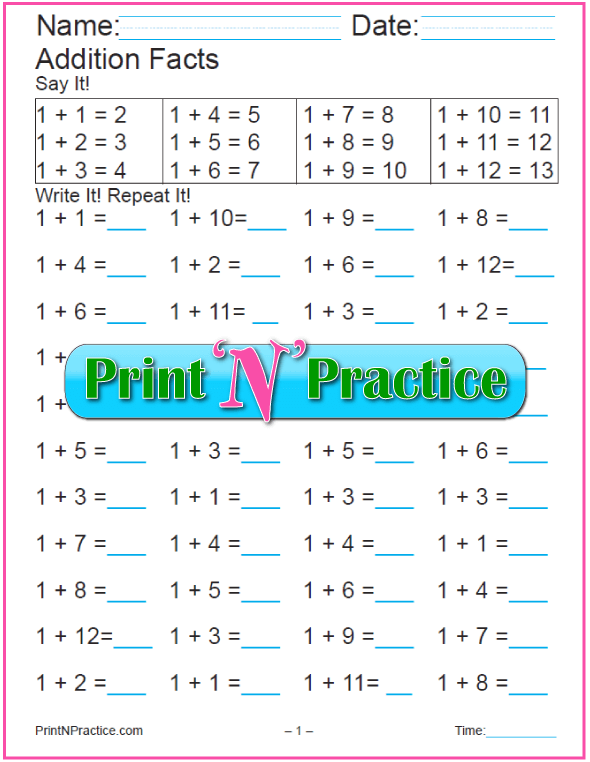 Order Printable Math Worksheets for Kids including all our addition worksheets for kindergarten as well as hundreds more in one download. 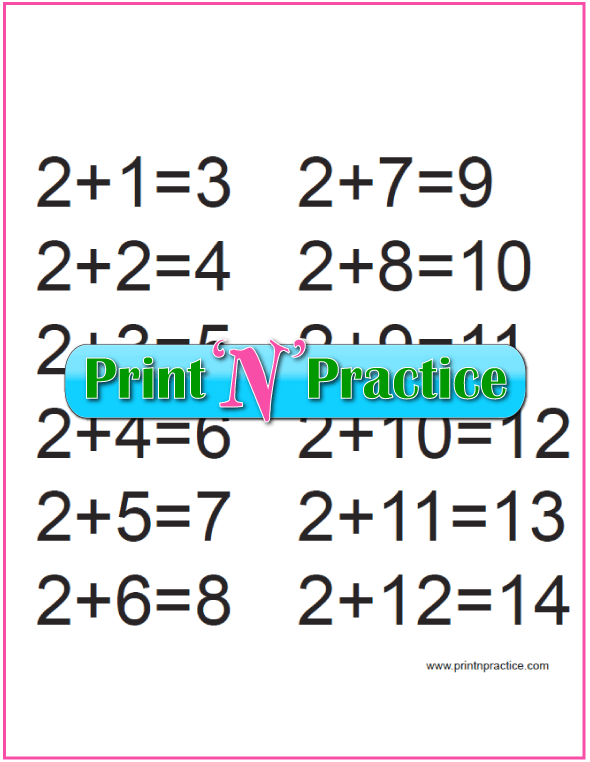 Also, for first grade addition worksheets, if you are using all 12 addition tables the last few are very easy since most of the addition facts have been studied in the earlier tables. Be encouraged. and remember to encourage your students that memorizing gets easier. It is so fun to watch a student zoom through the 8s, 9s, 10s, 11s, and 12s after he has belabored the first 7 tables! 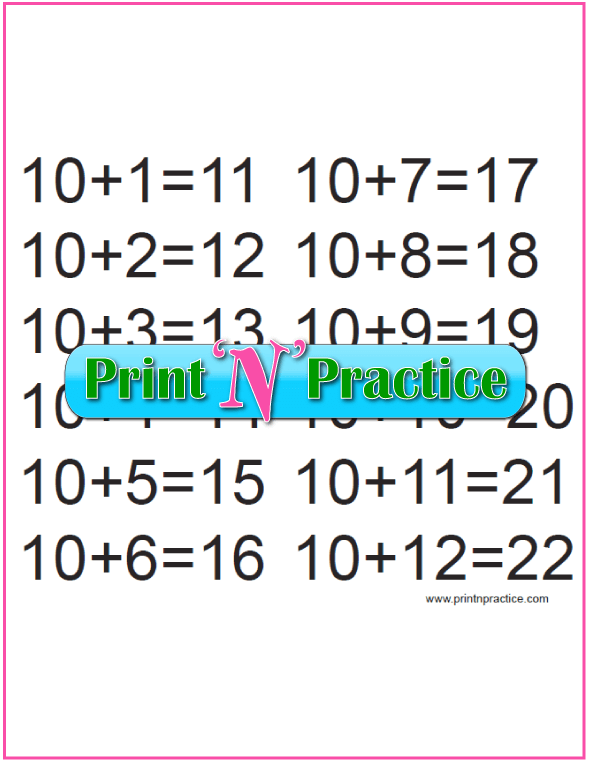 Also, once children understand addition or "get the idea"; subtraction is often a natural and will not need nearly so much drill and practice time. Show the inverse as you teach addition as you use our first grade addition worksheets. 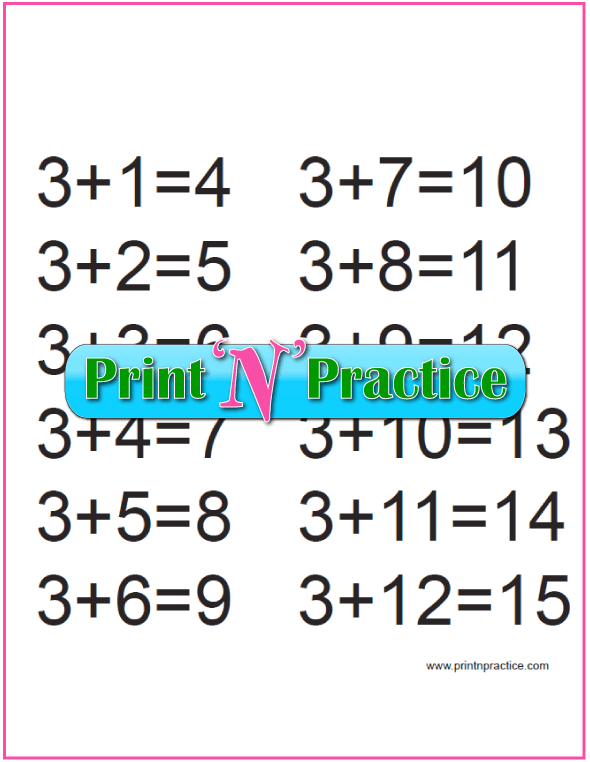 After using these addition worksheets for kindergarten, subtraction will be much easier. 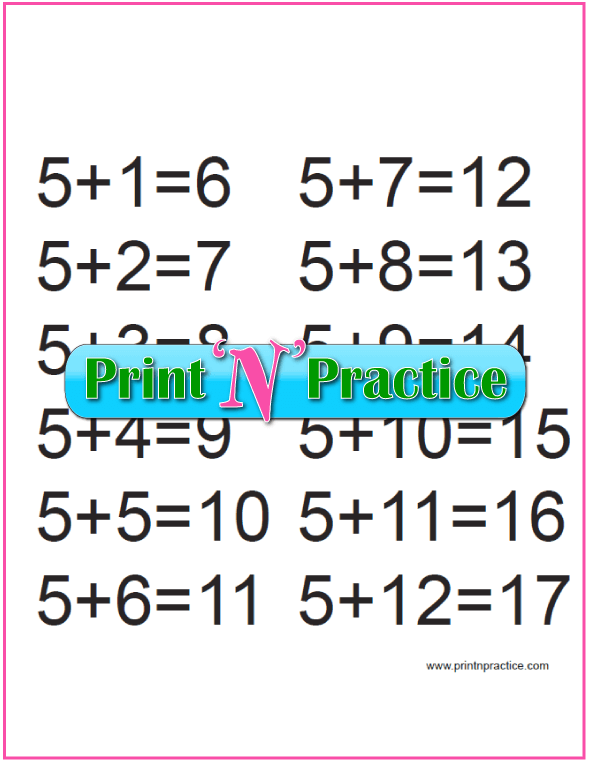 These next treasures show the association between addition and subtraction with these first grade addition worksheets. 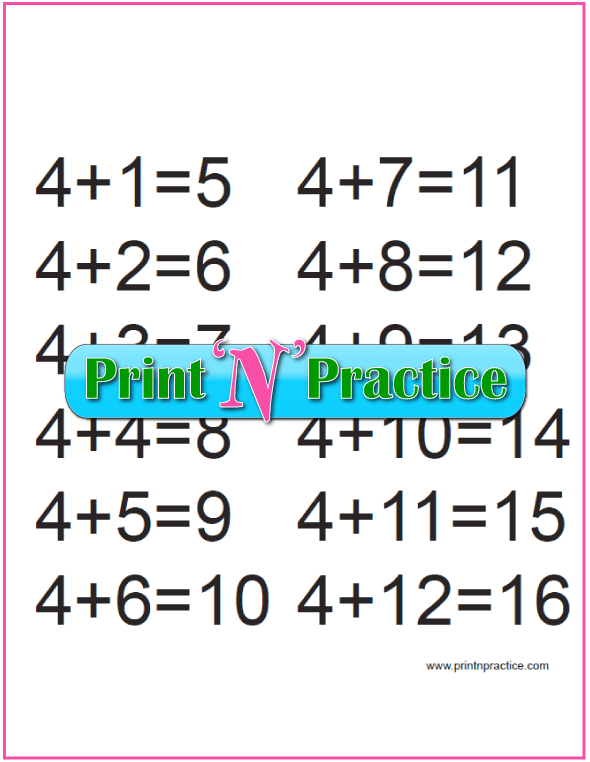 Some students "get it" right away and can learn to subtract at the same time that they learn to add. Other children need explicit practice. 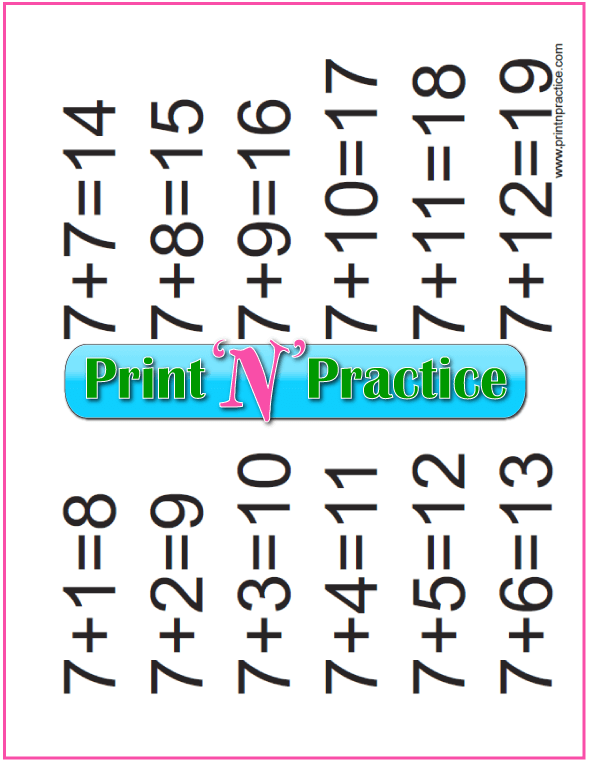 These addition and subtraction worksheets are great for both kinds of students or for older students who need fast practice and review. They are truly super for older children who need to review at the beginning of the year. Kids get twice the learning for the same effort! Always make as many associations as you can so that the practice makes more sense and will be remembered longer. 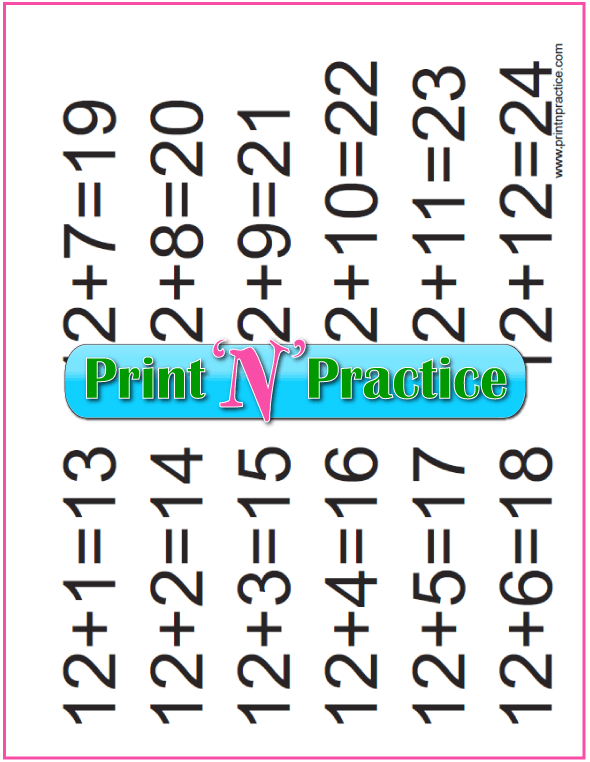 Print these addition and subtraction worksheets for quick association practice. Print the chart on card stock to put in your binder for reference. 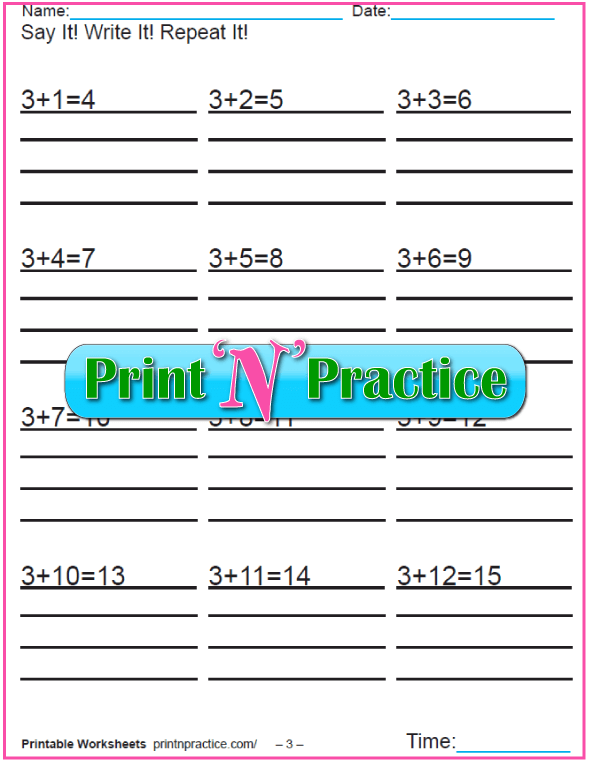 Print double sided with our multiplication to division chart and have all the facts together on one reference sheet. These first grade addition worksheets are phenomenal boosters when your student says, "I can't do it." and you know that all he needs is practice. The addition tables are at the top of these worksheets with equations to answer by filling in the blank at the bottom! Open book quiz at its best. I love these simple first and second grade addition worksheets because they're great confidence boosters. They're especially helpful at the end of first grade. 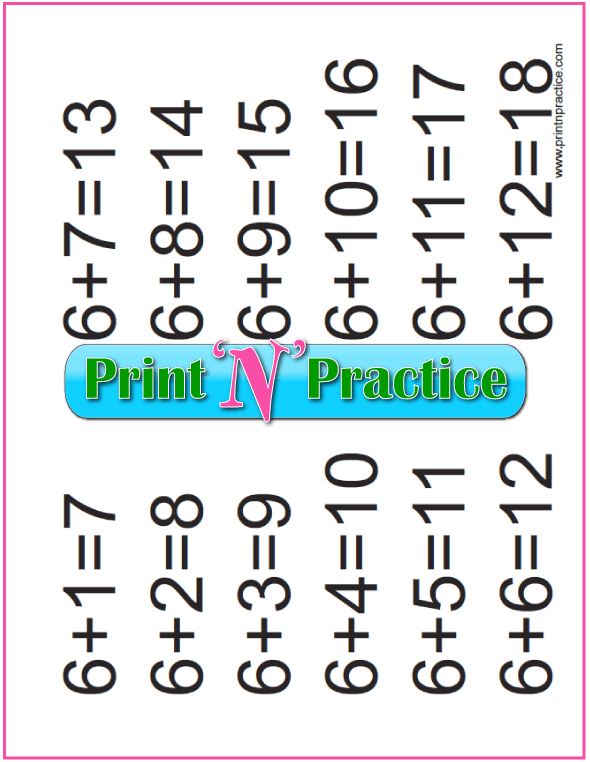 These make teaching addition facts easy and practically self-study. Saying the words while writing is a big help for most students. 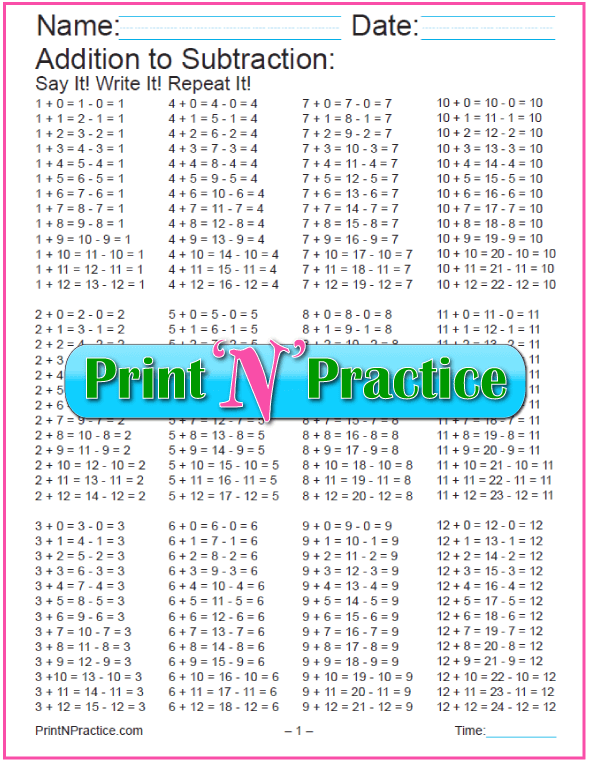 This is a twelve sheet download or you can print the pages you need. Use the landscape addition charts as wall posters - use a hole punch and hang them near where your student does Math homework and change to the next addition table when he is ready. Great for you to keep in a "practice binder" that you can use for classroom or group practice. This addition chart flips like a calendar and is also great for kindergarten addition. Below these are portrait style addition charts. 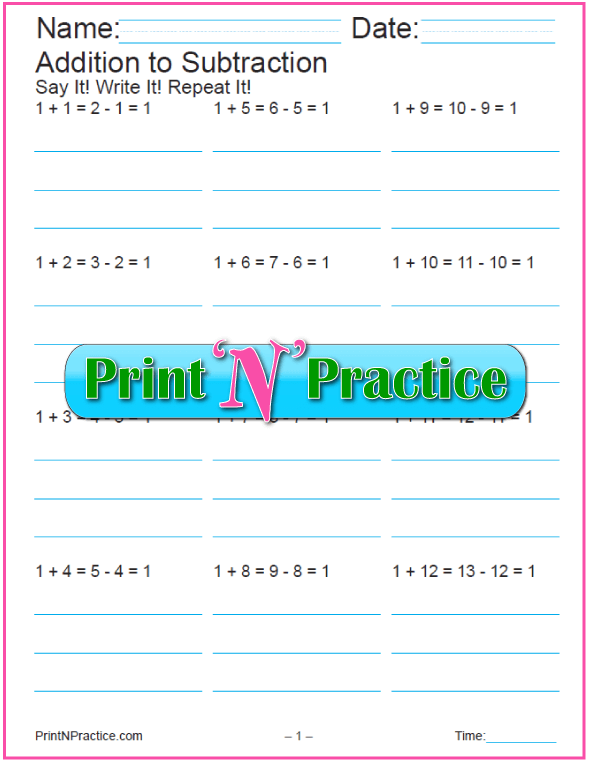 Use the portrait addition charts below as addition flip charts on a clip board for class or multi-student review. This is my favorite way to review the Math facts in small groups and with visual kids who are using first grade addition worksheets. It is so handy to have all twelve of these portrait sheets on a clip board when you have students who are studying different levels. I simply go to the right addition table for my students who are struggling, and review each equation three times. I love to see their happiness at finally "getting it"! The flip charts make easier review than writing and even waiting on the next flash card. These printable addition worksheets have space at the top for the clip part of your clip board. 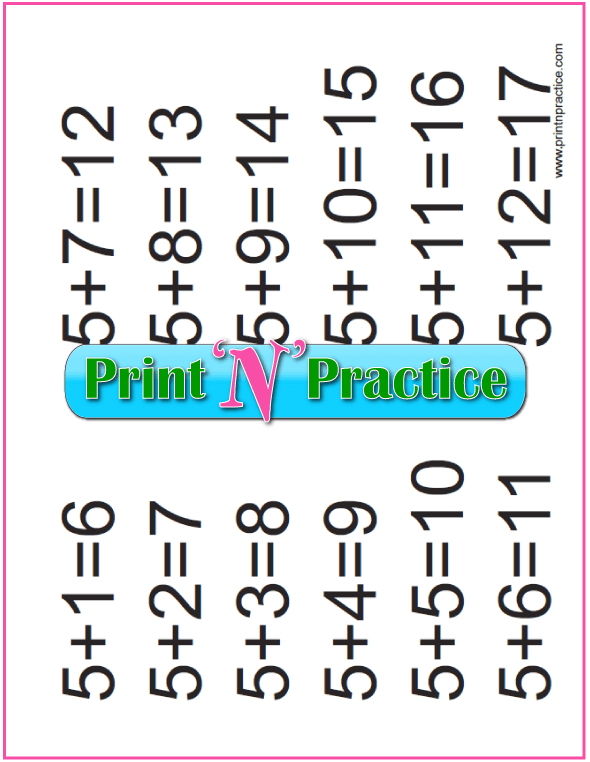 They are an easy replacement for addition flashcards; less fumbly, too, just be sure to point to the right equation. 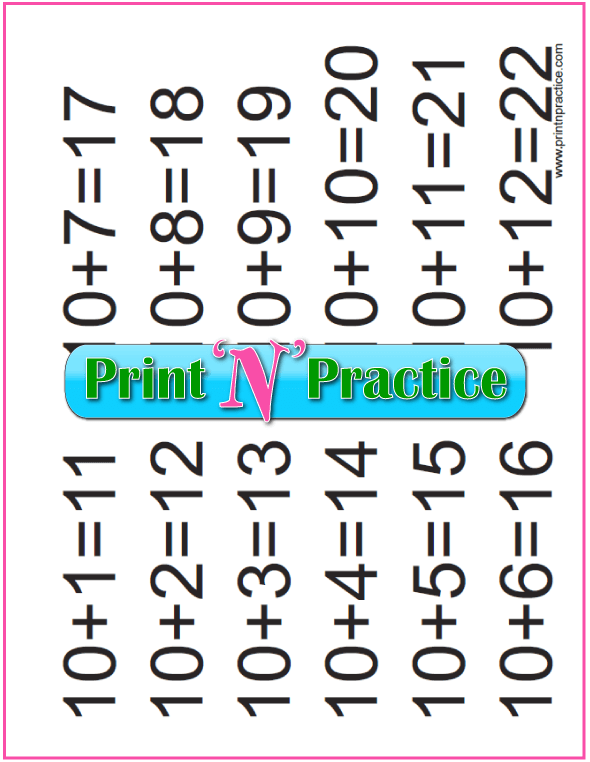 They go great with the rest of our addition worksheets for kindergarten, first grade and second grade. I put my hand or a 3x5 card below the right equation to hide the next equations. You can fold the page in half, too. The more trouble your student has learning addition, the more careful you have to be with flash cards and charts. I recommend that you cover other equations with your hand or a pretty cardboard frame. Only show one flash card at a time. Our ad free addition videos are fool proof for both kindergarten and first grade addition practice. 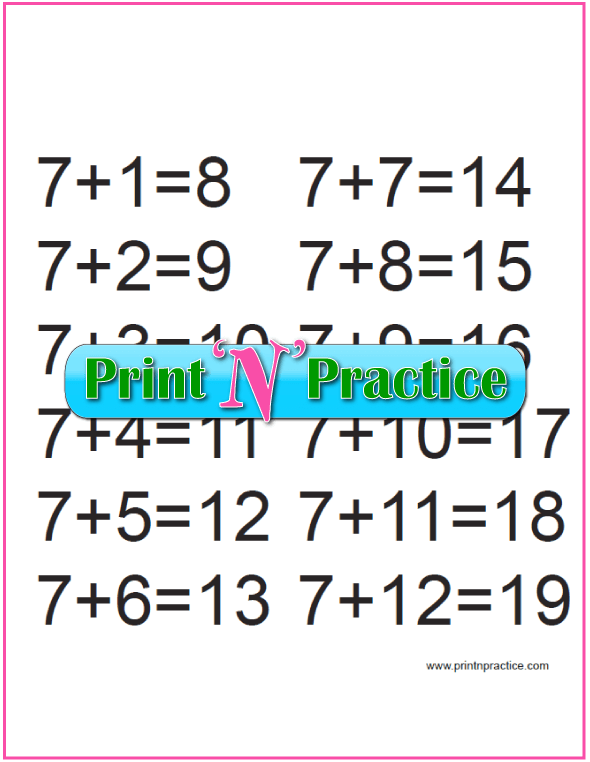 This page has scores of addition worksheets for kindergarten and first grade.